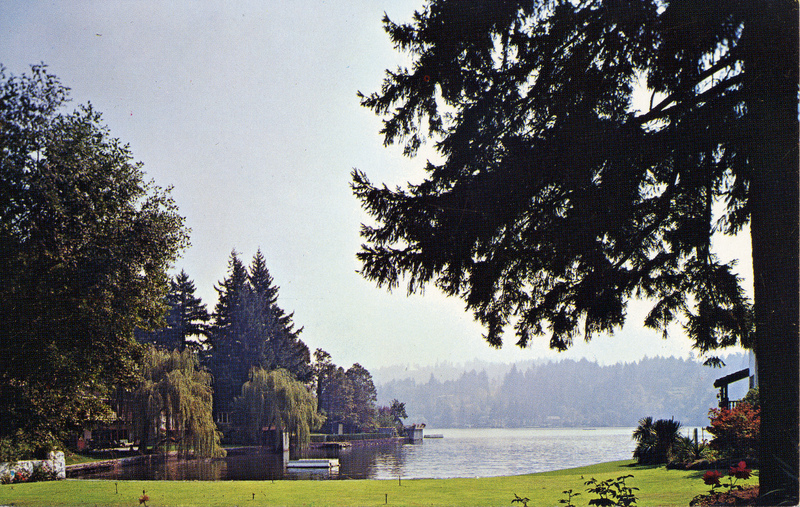 [imprint on back]: Lake Oswego, Oregon. The lake was enlarged in 1871-72 when Chinese laborers dug, by hand, the canal which joined the lake with the Tualatin River. You may get additional free copies of this card suitable to send your friends by phoning Goodall Oil Company at Ne 6-1656. Color photograph by Delano Photographics. Description Color photograph from shore. Transcription [imprint on back]: Lake Oswego, Oregon. The lake was enlarged in 1871-72 when Chinese laborers dug, by hand, the canal which joined the lake with the Tualatin River. You may get additional free copies of this card suitable to send your friends by phoning Goodall Oil Company at Ne 6-1656. Color photograph by Delano Photographics.